A new online course is making undergraduate public health instruction a lot easier, say the publishers of this innovative learning tool, developed specifically for the increasingly popular Major or Minor in Public Health. 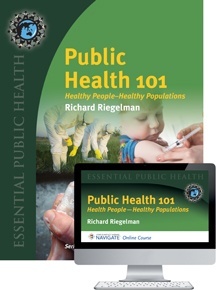 Produced by Jones & Bartlett Learning, Navigate Public Health 101 combines proven content from the best-selling textbook by Richard K. Riegelman, with interactive learning exercises and course management tools, all in an instructor- and student-friendly online learning environment. This comprehensive, ‘off-the-shelf’ course is highly customizable, giving instructors plenty of flexibility to either ‘plug and play’ or make it their own. Instructors who adopt Navigate Public Health 101 will benefit from the comprehensive course management tools including fully exportable grade book, advanced reporting, surveys, calendars, announcements, course content scheduling, journal, automated grading, and assignment management. Their students will gain access to the complete online course including lectures with audio, interactive exercises, quizzes, and collaboration tools, including discussion forums, student/instructor blog, text-based chat, and a community wiki. Navigate Public Health 101 is fully customizable so instructors can rearrange page elements or import their own materials including documents, videos, and quizzes. The full package, including the printed textbook with access to the online course, is priced at only $16 more than the textbook alone. eBook options are also available through Jones & Bartlett Learning partner, CourseSmart (www.coursesmart.com). Richard K. Riegelman, MD, MPH, PhD is Professor of Epidemiology-Biostatistics, Medicine, and Health Policy, and Founding Dean of the George Washington University School of Public Health and Health Services in Washington, DC. Dr. Riegelman has over 70 publications including 6 books for students and practitioners of medicine and public health. He is currently editor of the Jones & Bartlett Learning series Essential Public Health. The series provides books and ancillary materials for the full spectrum of curricula for undergraduate public health. He has taken a lead role in developing the Educated Citizen and Public Health initiative which has brought together arts and sciences and public health education associations to implement the Institute of Medicine of the National Academies recommendation that “…all undergraduates should have access to education in public health.” Dr. Riegelman also led the development of George Washington’s undergraduate major and minor and currently teaches “Public Health 101” and “Epidemiology 101” to undergraduates.